Starting with lowest rental plan Rs. 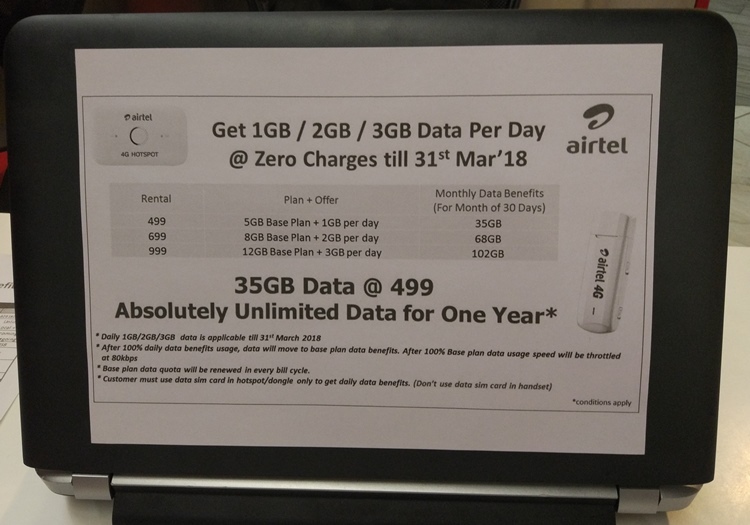 499, the lowest only plan would offer 1 GB data per day for whole month along with base data of 5 GB, effectively offering 35 GB data per monthly cycle. Similarly the other 2 plans at monthly rental of Rs. 699 and Rs. 999 would offer 2GB and 3GB data respectively for a month along with base data of 8 GB and 12 GB thereby offering an effective total of 68 GB and 102 GB data in a monthly plan cycle respectively. Now coming to the terms & conditions, the 1GB/2GB/3GB data is promotional and would be available till 31st March 2018 only after which a user would get only base data as mentioned already i.e. 5 GB, 8 GB & 12 GB only. These plan are specific for Dongle users only and won’t work with Mobile Handset. Only after the daily limit of 1GB/2GB/3GB is exhausted, user would be able to use data from base plan. You need to visit a nearest Retail outlet to avail the same or you can also visit airtel website.